Volunteers during our 2017 North American Sea Glass Festival, creating new friends and memories to last a lifetime! For sea glass enthusiasts, there are many reasons to celebrate the spring, one of which is the highly anticipated announcement of NASGA’s annual festival. Hence, as recently publicized, the association’s 13th annual North American Sea Glass Festival will take place on Oct. 27 – 28 at The Wildwoods Convention Center in Wildwood, New Jersey. However, unlike annual events that are held in the same location, and on similar dates each year, the fact that the sea glass festival is a “traveling show” requires never ending planning and fails to lighten the workload from one year to the next. For instance, solely selecting a venue each year – one that can not only accommodate the specific needs of the festival, but is also affordable, conveniently located for the majority of exhibitors and attendees, and available on preferable dates – can be particularly challenging. Promoting and advertising the event can be trying too, especially since the members of the planning committee, who also vary from year to year, are often unfamiliar with the city chosen to host the event. Yet probably the most difficult task associated with a traveling festival is recruiting volunteers, and NASGA could not be more blessed in this area. According to Williams, without the excitement and commitment of the volunteers, it would be difficult to handle all of the behind-the-scenes tasks that allow the festival to operate smoothly. Throughout the event, as avid hobbyists display their impressive sea glass collections, exhibitors offer their artwork and books, and speakers share their special knowledge, the volunteers oversee NASGA’s information table, distribute tickets and programs, answer questions, direct attendees, and provide coverage for exhibitor booths. And on Sunday, the second and final day of the show, the volunteers assist with the culminating event, the infamous SOTY (“Shard Of The Year”) Contest, which many consider the highlight of the festival. For the contest, attendees are encouraged to enter their most impressive sea glass finds, and cash prizes are awarded for the “winning shard” in each category (frosted bottle, art glass, buttons/beads, figural, most unusual, whimsical toys, pottery/ceramics, historical, marbles, and the grand prize, the “Overall Beauty”). The contest is comparable to a “traveling sea glass museum” and is an absolute treat for those interested in the pastime. Dr. Barbara Boyce & Sharon Brubaker enjoying some beachcoming together. Not surprisingly, Dr. Boyce and her friend Sharon Brubaker were inspired to contribute to the event due to their mutual affection for sea glass. In September of 2014, the two friends embarked on a road trip to Cape May, New Jersey to volunteer at the association’s 9th annual festival, which proved to be a particularly memorable experience. For the first time in the show’s history, the number of attendees exceeded the maximum capacity of the ballroom, and the fire marshal had to step in to monitor the number of individuals exiting and entering the hall. As Boyce suggests, “The Cape May NASGA festival was my first experience. Every person who attended can likely recall a crazy, fun, and crowded time. I was hooked. I thought I was familiar with sea glass through reading, but I realized that I had much to learn. The folks at NASGA are the experts, and I drank in every word and could not wait until the next year to volunteer.” Today, both Boyce and Brubaker are extremely knowledgeable about sea glass, and it is a joy to observe them respond to questions from attendees and help educate the public about the tumbled treasures. Each year, the allure of the hobby encourages seasoned and new volunteers alike to contribute to the festival. Among the group of devoted “regulars” are mother and daughter teams, husband and wife pairs, and close peers who share a passion for sea glass and enjoy working together. Some volunteers have been assisting at the festival for over six years, and as each show kicks off, it is especially rewarding to overhear shrieks of delight as friendships are reignited between returning exhibitors, volunteers, and attendees. Yet even though NASGA is blessed with loyal volunteers, further support at the show is always welcome, so the association reaches out by advertising on the festival’s Facebook page and contacting local sea glass groups and non-profits, as well as the hosting city’s Chamber of Commerce in an effort to recruit enthusiasts. Particularly when an event is running smoothly, attendees are unlikely to give any thought to the source of organization and support behind the scenes. Therefore, it bodes well for the sea glass festival that those who are busy pulling the strings often go unnoticed. However, if it seems to defy logic that the individuals who do the most work also receive the least amount of credit, keep in mind that the explanation is all in a name: “volunteer” – a person who does something, especially for other people or for an organization, willingly and without being forced or paid to do it” (dictionary.cambridge.org). A statement made by volunteer Sharon Brubaker lends credence to the definition, “It has been a pleasure to interact with everyone at NASGA. Now that I am a repeat volunteer, I genuinely look forward to seeing sea glass kindred spirits each year.” Without a doubt, the NASGA volunteers are the hidden gems of the annual festival. The 12th Annual North American Sea Glass Festival will be held on Saturday, September 23, 2017 and Sunday, September 24, 2017 at the Chase Center on the Riverfront in Wilmington, Delaware along the revitalized Christana River waterfront. Wilmington is a city in Delaware on the Christina and Delaware rivers. Downtown’s early-20th-century DuPont Building is part of the local DuPont family legacy, which is also evidenced at the Hagley Museum. Those grounds include the 1802 DuPont gunpowder works and the family’s Georgian-style home. The Old Swedes Church, between the Christina River and Brandywine Creek, is from 1698. European settlement had begun with the arrival of the Swedes and Dutch in the 1630’s and were the first European settlers in the Delaware Valley. This year the North American Sea Glass Festival is excited to take place in one of the first locations in the United States to brew and bottle beer. Why is this fun fact relevant to our festival? Because as all sea glass collectors know, beer bottles and their colors, clear (white), amber and green are still plentiful to find and still makes sea glass collectors happy to find, even if they are considered sea glass common colors. Here’s some interesting information and excerpts from Delaware Beer History about the history of beer (and bottling!!) in Wilmington, Delaware. Skip ahead a few hundred years and prohibition stopped beer operations in America. However, one of Delaware’s beer pioneers, Carl H. Eisenmenger maintained ownership of Wilmington’s Bavarian Brewery at 5th & DuPont Streets. “Eisenmenger, who understood that Prohibition would likely soon be a reality, had began brewing a ‘near beer’ cereal beverage as early as 1918. In 1919, the Bavarian Brewing Company officially changed its name to the Peninsula Products Company, Inc. The company continued with its Quex ‘near beer’ product and added a line of soft drinks. After an initial surge in business, the venture ultimately failed and, in 1925, Peninsula closed its doors for good. Eisenmenger, who maintained ownership of the 5th & DuPont property, rented the complex to other soft drink companies and businesses. He temporarily withdrew from the beverage industry but would return again to revive brewing operations after repeal of the 18th Amendment. After the North American Sea Glass Festival, meander along the Christina waterfront to find modern day craft brewers to quench your thirst, such as Iron Hill Brewery, located a short walk from the Chase Center on the Riverfront. Hartmann and Fehrenbach Brewery, had its origins with the “Father of Lager Beer in Delaware”. The year 1890 also saw the Hartmann & Fehrenbach Brewing Company expand their operations into bottling, which were beautifully embossed with the company’s logo, the mythical winged stallion, Pegasus. While other regions in America have been better known historically as centers of beer production, few have been brewing as long as Delaware brewers. For nearly four centuries, First State brewers have been producing high quality, award-winning ales and lagers. Explore the state’s fascinating and, until now, largely unknown brewing history on this site and in the pages of the book Brewing in Delaware by John Medkeff, Jr.
“Until the late 1800s, most beer was sold in kegs since bottled beer had to be consumed quickly or it would spoil. But the advent of pasteurization in 1876 made it safe to bottle fermented products, and along with America’s growing rail system, the bottled-beer industry boomed. In the early 1890s, Congress passed taxes on bottled beer, along with legislation allowing companies to bottle their brews onsite and bypass an archaic process of barreling, transporting, and packaging their drinks into bottles elsewhere. Prior to this action, beer bottles often featured a bottling credit on them in addition to the name of the brewer, which is one way to date a beer bottle. While early beer bottles came in a variety of glass colors, including brown, blue, green, and clear, the first American bottles were made from ceramic stoneware. This style was often used for dark beers like porters and stouts or non-alcoholic drinks like root beer or ginger ale. Buyer beware! With all the fake sea glass for sale online, how can shoppers tell the difference between fake and genuine sea glass? This lecture by NASGA founder Richard LaMotte and the current NASGA Education Chair Mary McCarthy will describe how consumers and collectors can distinguish the difference between genuine sea glass and fake sea glass, including an exhibit of sample fake sea glass. Richard LaMotte is the author of the award-winning book Pure SEA GLASS and a recent sequel titled The Lure of Sea Glass. He was a co-founder and past-president of the North American Sea Glass Association. Richard works in Chestertown, Maryland and lives in southeast Delaware. He and his wife Nancy started a Chesapeake Bay sea glass collection for her jewelry business in 1999. In 2002 he began researching glass history for a lecture which led to extensive research into glass colors, as well as the physics and chemistry behind the frosted glass forms found along the shoreline. In 2006 Pure Sea Glass was awarded first place for non-fiction in Writer’s Digest 13th Annual Self-Published Book Competition. Richard and his book have been featured in The Washington Post, on Martha Stewart Living TV, Coastal Living, Parade Magazine, Baltimore Sun, The Boston Globe, Delaware Beach Life, on NPR and Maryland Public Television. Bestselling author Mary McCarthy is a lifelong journalist whose career includes a number of national and regional newspapers, magazines and websites. She lectures at the University of Maryland’s College of Journalism and is an instructor at the Writer’s Center. Mary serves on the Board of Directors of the North American Sea Glass Association where she is also Chair of the Education Committee, speaking regularly at beachcombing conferences around the country. Mary is a mother of four on Maryland’s Eastern Shore where she enjoys kayaking and beachcombing. She is the founder of SeaCrate, an ocean-themed monthly subscription box service and is currently working on a beachcombing memoir. A life-long beachcomber, Dr. Deacon Ritterbush (aka Dr. Beachcomb) is an award winning author (A Beachcomber’s Odyssey) and founder of the annual International Beachcombing Conferences. She lectures throughout North America on sea glass, pottery shards and the archaeology of beachcombing. To learn more about her or about beachcombing, visit Dr. Beachcomb on Facebook, Instagram and http://www.drbeachcomb.com. Her lecture at the 2017 NASGA Sea Glass Festival will focus on fishing floats from the east and west, including their practical and spiritual aspects as well as the amazing sea glass shards resulting from their breakage. What Makes Sea Pottery Regionally Distinct? Lifelong beachcomber and avid collector Connor O’Brien will discuss his experiences beachcombing and investigating sea worn artifacts that were collected during his international travels and correspondence with beachcombers around the world. The topic will be sea pottery, with an emphasis on factors that make sea pottery regionally distinct. Attendees will enjoy one of the largest showcases of sea pottery to date, handle exotic shards from around the world, as well as learn the skills required to identify and date sea pottery. Viewers should expect to walk away with an increased appreciation for the aesthetics and history of sea pottery as well as an eagerness to take a closer look at their own pottery finds. The 10th Annual North American Sea Glass Festival held in Ocean City, Maryland this past August was an exciting time for attendees, particularly those that entered the coveted Shard of the Year contest. The Shard of the Year contest gives private collectors an opportunity to show off some of their collections and win a cash prize. The 2015 festival brought many unique finds, so much so that the five judges had a hard time deciding the final grand prize winner. After deliberation, the grand prize chosen was a stunning large aqua ridged piece. The judging closed and the time came to announce the winners. The room was filled with anxious collectors, each hopeful that their piece would be the winning piece. The Shard of the Year contest has ten other categories, and as each winner was called up to the podium, they were beaming with excitement. Finally, the grand prize winner was announced by Richard LaMotte, former President and noted sea glass expert and author. As Richard held up the large piece of aqua, the room was full of oohh’s and aahh’s, and Earl Brown’s name was announced as the Grand Prize winner. Earl was in a bit of shock and quiet in his demeanor. You will see from the photos and his answers below that he’s a no nonsense straight shooter. Just as each piece of shard entered holds a story behind them, the photos after the contest tell a story. The photos taken inside immediately following the announcement, Earl was stunned. A few minutes later, in the photo taken outside with Kim Hannon below, Earl is showing off his beautiful winning shard and the smile on his face is emerging. Earl explained after winning that he found the piece a week prior to the festival and was talked into submitting it on Sunday, making his win even more exciting! Earl had attended the festival on Saturday and showed one of the exhibitors who was amazed at his find and told him to enter the contest, however, Earl hadn’t planned on coming back on Sunday. After thinking about it Saturday night, Earl decided to come back and enter his new find. Earl explained to Kim Hannon, that he was out sea glass hunting very early in the morning, while it was still not quite dawn, and as he walked along the beach, somewhere between Bethany Beach and Fenwick, he came up to the aqua piece which was embedded in the sand in a shoe print! Can you imagine? Earl believes that it may have been stepped on by night fishermen. Wow, they weren’t aware that they were stepping on such a gorgeous piece of history. What the piece was in its first life: The aqua lens more than likely came off a 20th century small vessel starboard light, similar to the antique brass lantern shown here. When did you start collecting sea glass and where did you get the “bug”? Earl: Five years ago. Besides this beautiful find, do you have another favorite find you’d like to share? Earl: I have many nice pieces. The North American Sea Glass Association’s 10th Annual Sea Glass Festival in Ocean City, Maryland will be held August 29-30th, 2015 and will feature three lectures on Saturday. Each of the lectures will offer attendees a unique look into the historical significance of objects found along the region’s DelMarVa shorelines, and we’ll also have a lecture on Greek Sea Glass. Bill Winkler, with the Delaware Marine Archeological Society, will offer his knowledge of the local historical significance of sea glass and treasures, which can be found along the Delaware and Maryland beaches. Bill has either spent time at the beach or lived by it almost his entire life. In the early 1950s his family vacationed in Dewey, Delaware, where they rented a cottage on Dickinson Street. That’s where his love for the ocean started. Since then, that love has taken him from coast to coast, provided Bill with a career and even a glimpse of a time when schooners either mastered the sea or were swallowed whole by it. In ninth grade, a guidance counselor asked what career Bill wanted to pursue. He chose marine biology. He figured it would give him a chance to be by the ocean. That meant not being indoors—something Bill didn’t want to do if it would feel like the confinement of school. Bill received his biology degree from the University of Hawaii in 1970, then continued in graduate school through 1973. He eventually left his studies to work for the airlines. My career included working for Island Air, Aloha and Western Airlines. By the time he left the islands, Bill had lived surrounded by the Pacific for a decade. After Bill returned to the mainland, he migrated to the East Coast, where he made Pompano Beach, Florida, his home. Bill spent 17 years there fishing, surfing, scuba diving, treasure hunting for Mel Fisher and loving the beach life. Yet Bill returned to Sussex County, just miles from where he had vacationed as a kid. Though Bill was a skilled diver, he had spent years working along Florida’s submerged barrier reef system, there was little demand for his services. So Bill ended up in the retail business with TreasureQuest Shoppe on Route 26, where he sells nautical decor and specializes in metal detectors, for treasure hunting. Shipwrecks of Delmarva – art work by Robert Pratt, cartographer & research of the shipwreck locations with names & dates of sinking by Don Shomette. Of the 10,000 to 12,000 wrecks believed to lie on the sea floor, this is a one of a kind comprehensive representation. 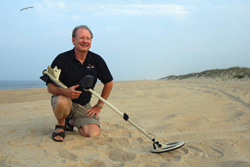 After years of selling metal detectors to people who discovered shipwreck artifacts on the beach, Bill and several friends founded the Delaware Marine Archaeological Society in 1997. In 2002 the society completed the first maritime archeological survey in Delaware at no cost to the state. They focused on one 255-foot unidentified ship that was in the surf zone at Beach Plum Island. The fact that this boat remains anonymous is amazing, considering that it is one of the largest schooners built during its time. After years of work, we put together a 3-inch-thick report titled the “Beach Plum Island Project,” which details the architecture of the schooner. It includes VHS video, more than 300 photographs and plenty of drawings. Since the report was finished, much of the ship has been broken apart and scattered by waves, but at least part of her history has been documented. Working in and out of the sea has taken Bill from the Atlantic to the Pacific, but now Bill finds himself on the same sandy shores he loved as a kid. Bill finds himself at home along the Delaware beaches; although he still has the urge to seek adventure on an uninhabited island somewhere out in warmer waters. Bill Winkler will feature a lecture, “The Historical Significance of Sea Glass & Treasures found along Delaware’s Coast” on Saturday at 11am during the North American Sea Glass Festival in Ocean City, Maryland on August, 29th – 30th. Enter your email address to follow NASGA and receive notifications of new posts by email.